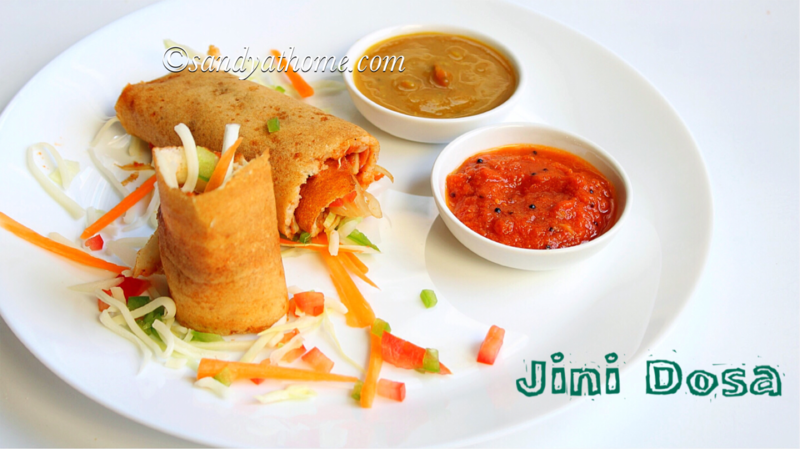 but for me just adding javvarisi/sago and perfect consistency of batter always yielded perfect fluffy idlies. 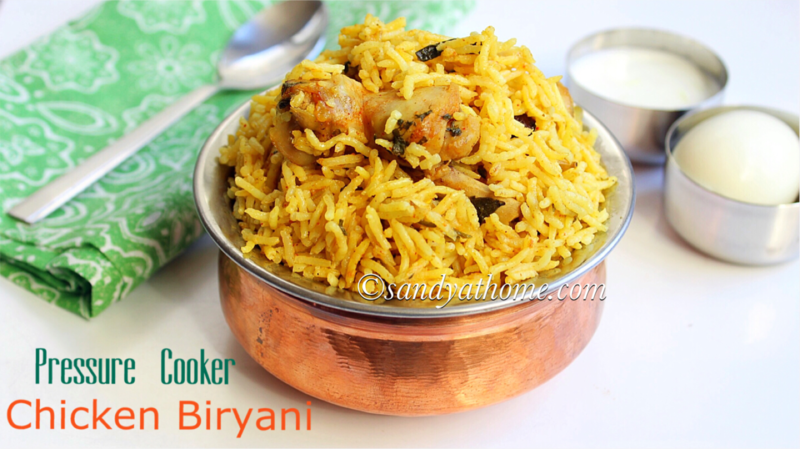 Do try this recipe and let me know how it turned out. So lets get to the making! In a bowl add urad dal, idli rice and sago/ sabudhana/ javvarisi together. Wash 3 to 4 times until you see clear water. Soak it in enough water for at least 8 hours or overnight. 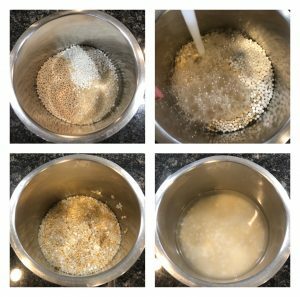 After 8 hours, in a wet grinder add little quantity of the soaked urad dal, idli rice and sago. Switch on the grinder, when it starts grinding gradually add little by little of all the soaked items. Grind the mixture into a smooth, thick and fluffy batter adding water in regular intervals when needed. I used around 1 cup water for grinding but it may vary according the soaking time. But the measurement is just a guideline to get a perfect batter. Also scrap the inner sides of the grinder often to get rid of coarse rice mixture using the scrapper provided along with grinder. 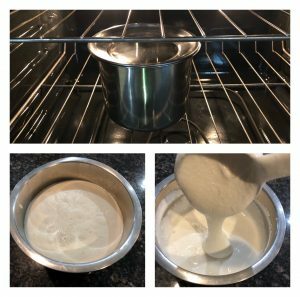 Allow the batter to ferment for 8 to 10 hours. After 8 to 10 hours of fermentation mix the batter well in the morning. For this recipe as I already mentioned I will use muslin cloth to make idlies. In the morning heat water in idli pot. 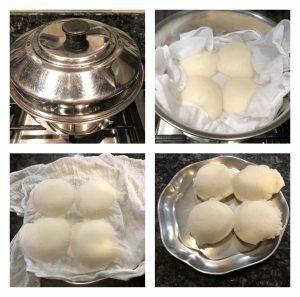 Pour ladle of batter in each idli mold over the damp muslin cloth and place the batter filled idli plates in the idli steamer and steam it for 10 to12 minutes. 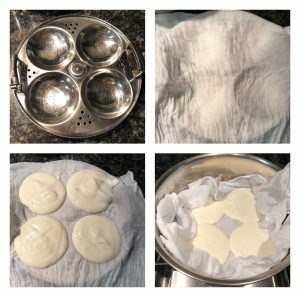 When done remove the idli plate from the steamer and keep it aside for 5 minutes. After 5 minutes wet a spoon with little water (wetting the spoon with water helps in and scoop idli from the idli plate and serve it hot with chutney. After 8 hours, in a wet grinder add little quantity of the soaked urad dal, idli rice and sago/javvarisi. Switch on the grinder, when it starts grinding gradually add little by little of all the soaked items. Grind the mixture into a smooth, thick and fluffy batter adding water in regular intervals when needed. I used around only 1 cup water for grinding but it may vary according the soaking time. But the measurement is just a guideline to get a perfect batter. Also scrap the inner sides of the grinder often to get rid of coarse rice mixture using the scrapper provided along with grinder. 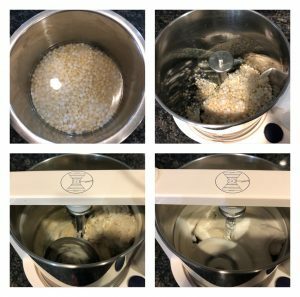 When the batter looks smooth, fluffy and thick switch off the grinder and transfer the mixture to a bowl, add required amount of salt and mix well. Allow the batter to ferment for 8 to 10 hours. I kept my batter in oven with oven light on water pre heating for a minute. 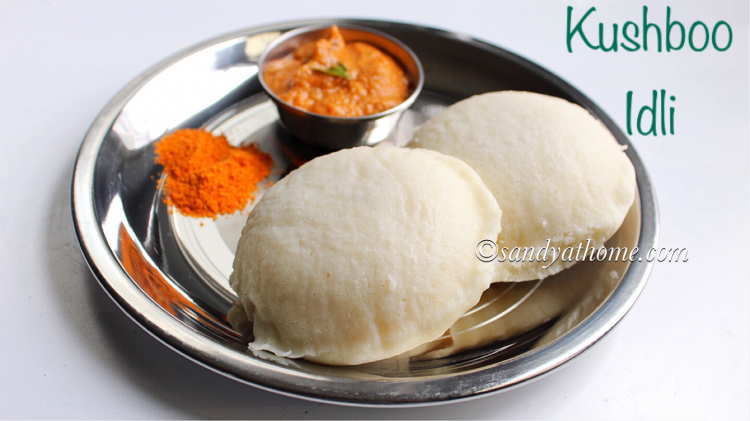 You can se that the batter has risen so well which yields soft and spongy idli. After 8 to 10 hours of fermentation mix the batter well in the morning. 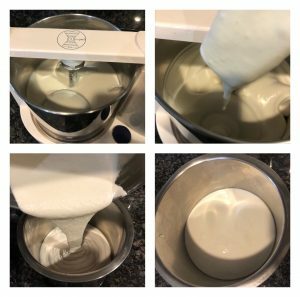 The batter should be very thick as shown in the 3 rd picture. For this recipe as I already mentioned I will use muslin cloth to make idlies. Wet the cloth lightly in a way it should not be dripping water just damp. Now place the cloth on idli plate. Now heat water in idli pot. 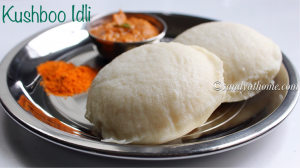 Pour ladle of batter in each idli mold and place the batter filled idli plates in the idli steamer. Now cover the steamer with a lid and steam it for 10 to 12 minutes. 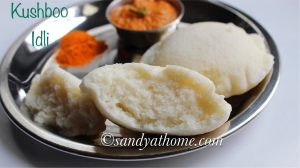 When done remove the idli plate from the steamer and keep it aside for 5 minutes. After 5 minutes wet a spoon with little water (wetting the spoon with water helps in and scoop idli from the idli plate and serve it hot with chutney.